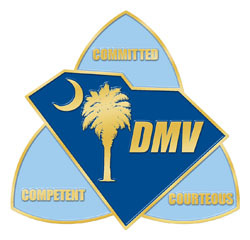 South Carolina DMV operates under the official name of the government and is managed and updated by the department. The licensing and titling laws are administered by this department in order to keep a strict control for the purpose of ensuring secure and verified licensing, allowance of permits and maintenance of property records. The emphasis of the department is also on accountability and efficient recovery of revenue in order to be utilized for the service of the public in the best manner possible. See the above listings for South Carolina DMV offices. To achieve this broad mission statement, the department maintains a strict protocol of license, permits, titles and registrations of various authorizations. These include plates, IDs, etc. The licenses vary according to the vehicle and the age of the driver but the purpose is to ensure accountability and proper, traceable record maintenance. South Carolina DMV website provides all the forms required to apply for licenses, registrations and permits along with manuals to guide the users about various procedures. The website also enlists the locations and phone numbers of the various offices accessible across the state. The users can contact the office for setting up an appointment for services before heading down to the station. This saves their time and dodging any possible inconvenience they might have to face. However, the working hours of the offices may vary from one another. The users can check the working hours of all offices online before making an appointment or going for a visit. More than half of the services that were available in person only are now available online. This has provided the users with a lot of ease and increased their knowledge regarding the laws, procedures and importance of legal paperwork.